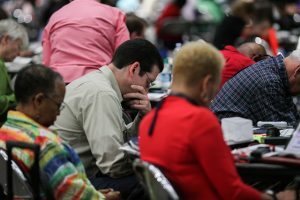 Delegates at the 2016 General Conference pause for prayer prior to casting a vote. The vast majority of delegates who attended the 2016 General Conference will be present in St. Louis, Missouri for the special General Conference in February 2019 (Maile Bradfield, UMNS). Last week, the Commission on General Conference (COGC) announced its proposed plan for how the delegates will address proposals intended to resolve the church’s long debate over its sexual ethics, teachings on marriage, and its ordination standards. Later this month the church’s highest court, the Judicial Council, will hear oral arguments regarding the constitutionality of the various plans coming before the special General Conference. And finally, the Council of Bishops is likely to issue a statement regarding the critical matters before the church after its regularly scheduled fall gathering the first week of November. The COGC announced that the special General Conference will begin on Saturday, February 23 with a day of worship, prayer, and preparation. Delegates will convene for their first plenary business session on Sunday, February 24, to receive and act on various reports. After dealing with such reports, the delegates will engage in a general discussion of the various plans, petitions and amendments proposed by the Commission on a Way Forward and other United Methodists. The purpose of the discussion will be to discern the direction the delegates want to pursue. On Monday, February 25, the delegates will meet as one legislative committee, chaired by one of the delegates, to consider, amend, and vote on petitions deemed in harmony with the defined purpose of the special General Conference. On Tuesday, February 26, delegates will meet in plenary session in an effort to adopt a plan that resolves, one way or another, a conflict that has come to threaten the denomination’s viability. This summer the Council of Bishops (COB) petitioned the Judicial Council (JC) for a declaratory decision on the constitutionality of the three plans proposed by the Commission on a Way Forward (COWF): the One Church Plan, the Connectional Conference Plan, and the Traditional Plan. The COB is hoping the JC will determine if any provisions of the various plans are unconstitutional before the General Conference delegates vote on them. Without a ruling on the various plans’ constitutionality it is possible delegates could approve a proposal that would later be vacated by the JC for constitutional violations. The JC is set to hear oral arguments on Tuesday, October 23, in Zurich, Switzerland. In preparation for the hearing, Judicial Council members have reviewed over 700 pages worth of written briefs submitted by interested parties arguing for and against the constitutionality of the various plans. The JC has allotted three hours and twenty minutes for the oral hearing, with most of the time granted to the COB and the COWF representatives who filed the enabling petitions for each of the plans. The Rev. Keith Boyette, President of the Wesleyan Covenant Association, will be present to argue that critical aspects of the One Church Plan are unconstitutional. If the Judicial Council rules, in whole or in part, that a plan is unconstitutional, proponents of that plan will have to determine whether the constitutional infirmity can be corrected. If arguments against the constitutionality of the One Church Plan are sustained, key portions of it would have to be set aside. Such a ruling would largely undermine its viability as a potential way forward for the church. Others will argue against the constitutionality of parts of the Traditional Plan. Challenges to the Traditional Plan are largely limited to particular portions of it; therefore, the General Conference could still vote to implement its other provisions. The JC typically issues its decisions within a few days following the adjournment of its meetings. The body is likely to release them between October 27 and November 3. Decisions are published at www.umc.org. The WCA will report on them as soon as possible. A chastened COB will meet in St. Simons, Georgia, beginning November 4, 2018. Earlier this year the JC issued a ruling that significantly curtailed the COB’s role in the process of preparing for and presenting proposals to the special General Conference. In May of this year, Bishop Bruce Ough, past-President of the COB, argued before the JC that only the One Church Plan was in harmony with the COB’s stated call for the special General Conference, and therefore it should be the only plan to officially come before it. The JC rejected Ough’s argument and ruled any petitions properly submitted and in harmony with the call of the special General Conference are in order and shall be received by the body. The COB’s fall gathering is its last scheduled meeting before the special General Conference. Church observers will be watching closely to see whether the council takes the opportunity to reaffirm its preference for the One Church Plan or decides to take a more muted stance in light of the Judicial Council’s spring ruling. Meanwhile, the WCA’s first Global Legislative Assembly will be held on Friday, November 2, at Mt. Bethel UMC in Marietta, Georgia. Approximately 170 delegates from 41 regional chapters plus Africa, Europe, and the Philippines will act on a number of resolutions to ensure a vibrant future for a Methodism committed to the historic Christian faith in the Wesleyan tradition. The 28-member WCA Council will meet the day before the legislative assembly, and on Saturday, November 3, the WCA will hold its Third Global Gathering under the theme Unashamed! Mt. Bethel UM Church, one of the denominations largest congregations, will host the meetings and the Global Gathering. Watch the video invitation to the event and register today to attend at the live venue or one of the 109 simulcast sites across the United States. Walter Fenton is an elder in the Greater New Jersey Annual Conference and the WCA’s Vice President of Strategic Engagement.